» A Movie Review by Walter Albert: THE FIGHTING BLADE (1923). 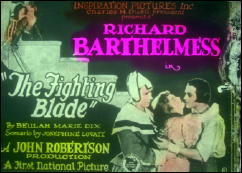 A Movie Review by Walter Albert: THE FIGHTING BLADE (1923). THE FIGHTING BLADE. 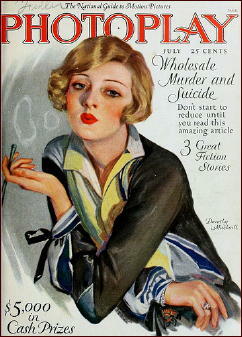 Inspiration-First National, 1923. Richard Barthelmess, Dorothy Mackaill, Lee Baker, Morgan Wallace, Bradley Barker, Frederick Burton, Stuart Sage, Phil Tead, Walter Horton. Story: Beulah Marie Dix; scenario: Josephine Lovett; art director: Everett Shinn. Director: John S. Robertson. Shown at Cinecon 39, Hollywood CA, Aug-Sept 2003. Barthelmess plays Karl Van Kerstenbroock, a Flemish soldier of fortune who joins Cromwell’s forces. Going undercover, he visits the home of the fiancé of Thomsine Mugrove (Mackaill) whose cowardly brother (Bradley Barker) had earlier fled a duel with Van Kerstenbroock. Musgrove risks her life to help Von Kerstenbroock and is rescued by him after he leads Cromwell’s forces to victory. Barthelmess is a somewhat unlikely action hero, but character development and conflict are not neglected in this film, handsomely designed by noted contemporary illustrator Everett Shinn. Barthelmess is moody and often diffident in his acting style, a striking contrast to the flamboyance of an Errol Flynn or Douglas Fairbanks, Sr. Thank you for an interesting review! I was disappointed by the one silent film I’ve seen directed by John S. Robertson. This was Dr. Jekyll and Mr Hyde (1920), with John Barrymore. It didn’t gel at all, and lacked strong story telling.